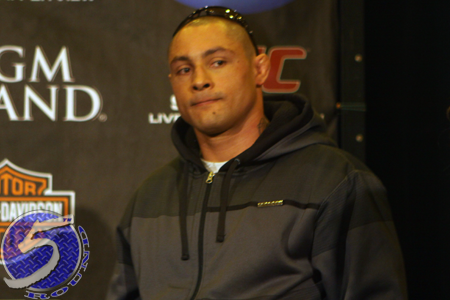 For the second time in less than two years, Thiago Silva (Pictured) has flunked a post-fight drug test. On this occasion, the light heavyweight screened positive for having marijuana metabolites in his system following this month’s submission victory over Stanislav Nedkov. Silva will have to ride the pine for six months retroactive from the November 10th fight date. He must also enter a drug rehabilitation program. “Thiago Silva tested positive for marijuana metabolites following his bout at UFC on FUEL TV in Macau,” the UFC revealed in a statement.”The UFC organization has a strict, consistent policy against the use of any illegal and/or performance-enhancing drugs, stimulants or masking agents. Silva was getting handled in the opening two frames before rallying to catch Nedkov in an arm triangle choke*. The victory had marked Silva’s first since beating Keith Jardine in 2009. It is believed the bout will be overturned to a no contest. After beating Brandon Vera at UFC 125, the 30-year-old was busted for submitting non-human urine for his post-fight exam. Although he initially denied taking any performance-enhancing substances, he later admitted he used something to help speed up the recovery for his injured back. That January 2011 scrap was ultimately overturned to a no contest and he was issued a year-long suspension. Silva was also fined 25 percent of his $55,000 show purse and $20K of his $55,000 win bonus. “UFC on FUEL TV 6” took place inside Cotai Arena in Macau. Because China lacks the governing body to sanction a mixed martial arts show, UFC officials oversaw the event – as customary with most out-of-country Octagon cards.